Later when I visited the shop and analyzed different brands came to a conclusion that this model is best for my budget and needs. There are four stages of washing like soak,wash,rinse and spin. We can decide the number of minutes the clothes to be soaked before washing. But the remaining three stages are not under user control. We can dry the clothes with extra spin using the air turbo option. The capacity of the machine is 6 Kgs. 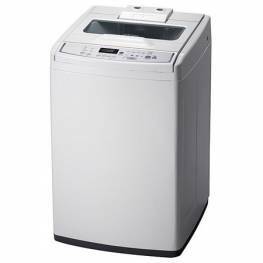 As soon as you switch on the machine depending upon the amount of clothes and the wash type chosen, the number of minutes will be calculated and shown on the digital screen available. The machine is also intelligent enough to display an error when there is no enough water to wash or if some other wrong option is chosen by the user. 2. If there is a voltage drop / electricity drop down in between washing, the machine will resume the wash once there is sufficient power. 2. No option to wash with hot water. Am using this machine for almost 10 years. Now just when 7 minutrs to finish, machine stops and "U3" displayed, can you please advise? samsung WA80T4G MODEL I WAS USING...ITS GOOD SINCE LAST 5 YEARS BUT NOW ITS PRODUCING HUGE SOUNDS WHILE SPINNING AND ALSO NOT ROTATING PROPERLY...I.E...ONLY SPINNING IN ONE SIDE....WOULD YOU PROVIDE ME A SOLUTION? 1.with out air turbo option my machine dry my clothes very well. 2.but now after complete wash,rinse,spin ,all clothes stay with water. 3.please reply how to overcome this problem.